from 1966, the GT-H featured gold-on-black paint and was only available at the Hertz car rental agency. Ford Racing Performance Group provided Shelby its FR1 Power Pack to add 25 horsepower to the existing Mustang GT powertrain with an additional 10 ft/lb of torque. The package included a 90mm cold air kit, muffler kit, a new X-pipe and Ford Racing "GTA" axle-back mufflers. The Ford Shelby GT-H also had the Ford Racing Handling Pack (FR3) which included specially tuned dampers, lowering springs, sway bars, strut tower brace, and a Ford Racing 3.55:1 ratio rear axle assembly. A total of 500 cars were built to celebrate the 40th anniversary of the original Shelby GT350H. For 2007, a convertible version of the GT-H was offered for rental at Hertz. This time the convertibles came with a custom light bar reminiscent of the 1968 Shelby Mustang convertibles. Shelby GT-H, except a manual transmission is available. The Shelby GT was a unique model in that, just like the Shelby Mustangs of the 60’s, the Shelby GT’s manufacturing was completed at Shelby Automobiles Inc. in Las Vegas, Nevada after being shipped directly there by Ford Motor Company. Shelby GT’s were then sold pre-title to customers. By comparison, GT500 models were manufactured solely by Ford Motor Company in Flint, Michigan. 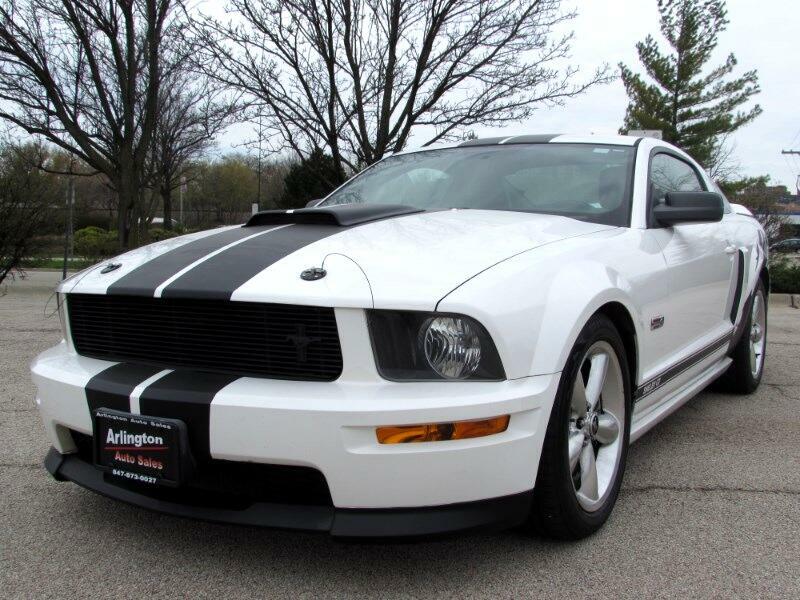 Production of the Shelby GT began in December 2006 and the car went on sale in January 2007. It was originally planned that a limited number of up to 6,000 cars would be built. The Shelby GT’s include the deletion of the rear spoiler, a retro Shelby hood scoop, a cold air induction system with performance tuning resulting in a power output of 319 hp (238 kW), a Ford Racing suspension package consisting of upgraded dampers, springs which lowered the vehicle 1.5” and sway bars, a high performance exhaust system, interior Shelby sill plates and badges and silver stripes, with the car available in either white or black in 2007 and Vista Blue, Grabber Orange, or Black with red stripes for 2008. The Grabber Orange Shelby GT-C (California) was sold exclusively in California and only available as a coupe (less than 220 models were produced). Following the 2007 Shelby GT-H convertible rental car, Shelby offered the 2008 Shelby GT as a Vista Blue coupe or convertible also in limited numbers.The Vista Blue models were available as a coupe or convertible.